Sharon Davis, one of LAC Group’s senior recruiters, has over 20 years of legal staffing experience. Sharon has placed personnel at virtually all levels and within every specialty needed by law firms and corporate legal departments. She has been with us since 2001, working in Denver. When it comes to fulfilling client needs, Sharon seeks to understand not only the position, but the culture and work environment as well. I ask a lot of questions to identify the types of individuals who will be most successful in the role and the best fit for the organization. Detailed job descriptions are helpful, but I also want to know as much as possible about management, work-style preferences and what types of growth opportunities are available for new hires. A typical work day for Sharon also includes the ongoing quest to find and recruit the best candidates. Behavioral questions help me get a feel for past performance and interpersonal dynamics, which is just one indicator I use to help gauge future job performance. I strive to understand the goals of the organization and compare them with the goals of individual candidates to make a successful, long-term match. Sharon is engaged with law firms not only professionally, but outside of work as a volunteer for the Colorado Lawyers Committee. The Committee is a consortium of more than 60 law firms dedicated to improving the lives of children and disadvantaged communities in Colorado through systemic changes in public policy. An immigrant from Senegal was shot and killed while waiting for a bus in downtown Denver, and it was motivated by nothing more than the victim’s race. I was deeply affected by hearing the story and seeing the makeshift memorial at the bus stop. I thought there must be a way to educate the community, especially kids, to prevent the kind of indoctrination that leads to these destructive beliefs and crimes. Sharon did find a way. She became a judge. Not a real judge, mind you, but an acting judge in the classroom. Sharon became a volunteer for the Colorado Lawyers Committee. In that role, she serves as “judge” in the mock trials staged for kids in 6th grade and higher, as part of the Committee’s Hate Crimes Education Task Force. The “trial” is based on a fictional case arising from a violation of Colorado’s Hate/Bias-Motivated Crimes Statute. While usually presented at middle schools and high schools in the Denver metro area, Sharon also participated in a presentation at one of the state’s juvenile detention centers. While volunteers like Sharon serve as facilitators and don the metaphorical robes of “judge”, practicing Colorado lawyers, serving in the roles of prosecuting and defending attorneys, present the case. 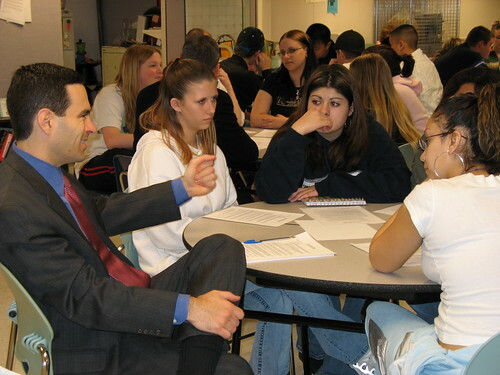 The students serve as the “jury” – multiple juries actually – who discuss the issues and are tasked with reaching a verdict, assisted by a volunteer facilitator. These mock trials go far beyond teaching Colorado laws against bias-motivated crimes. They engage young people in difficult discussions about diversity. Students also learn about the workings of a trial by jury and practice critical thinking and communication skills. However, the learning is mutual — Sharon says that all the volunteers working on the project, including the attorneys, believe they learn as much from the students as the students learn from them. Whether doing volunteer work for Colorado Lawyers Committee or recruiting legal, library and other information management talent for law firms, Sharon Davis is an example of an LAC Group employee who is immersed not only in her work and her area of expertise, but in a variety of other meaningful ways in her community. LAC Group recruiting and staffing services, or Contact Us directly. Visit LibGig, our online community for library and information professionals, for current openings and other career resources.